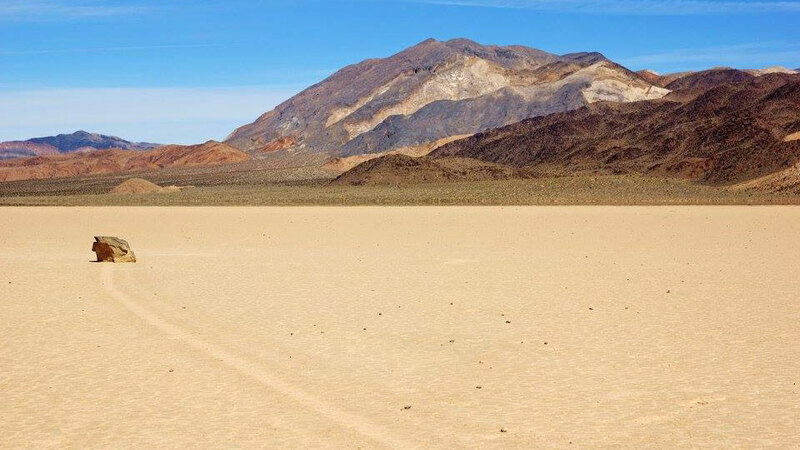 For those who make the journey out to a remote corner of Death Valley National Park, multiple wonders await. 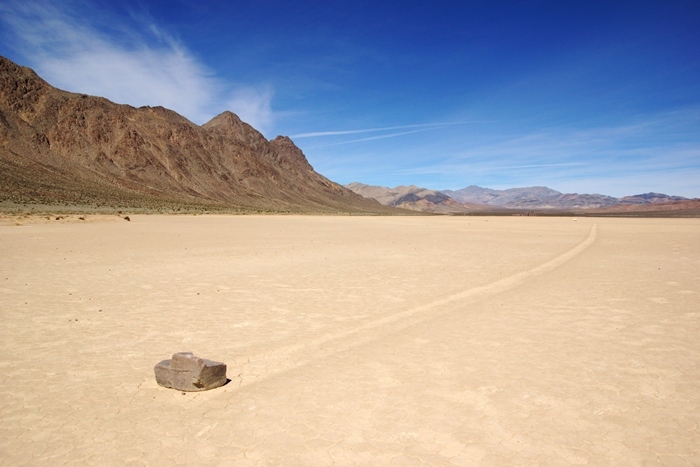 Not only do you get to experience the solitude of such an isolated place, you also get to walk out onto the flattest natural surface on earth – a dry lakebed playa. 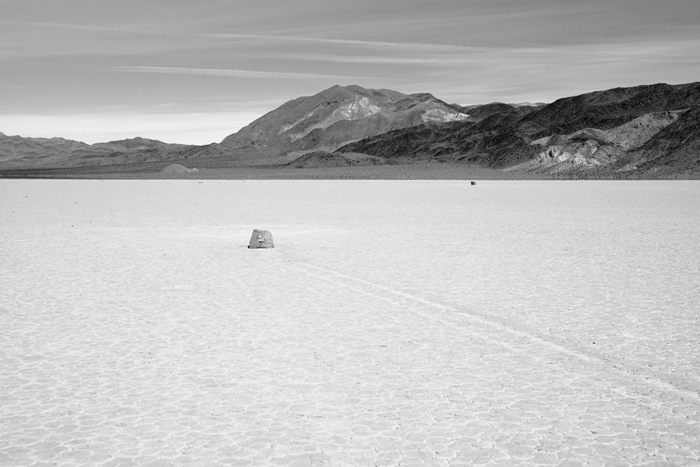 And then, you get to ponder the presence of space aliens and unseen magical forces, as you stare at dozens of rocks which somehow manage to slip and slide around the playa, leaving tracks behind in the dirt. 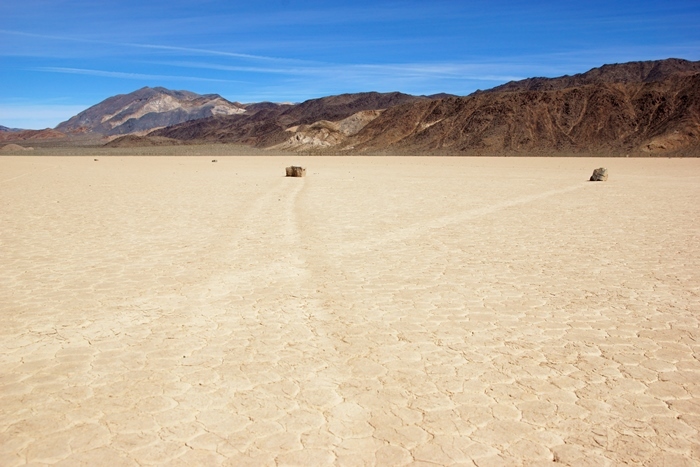 The Racetrack is accessed by a bumpy, 26-mile dirt road, that begins near Ubehebe Crater. From California Highway 190, take Scotty’s Castle Road northbound for 33 miles, then turn onto Ubehebe Crater Road for another 5 miles. Shortly before you reach the crater’s parking area (on the 1-way road), you’ll see a turnoff for The Racetrack. 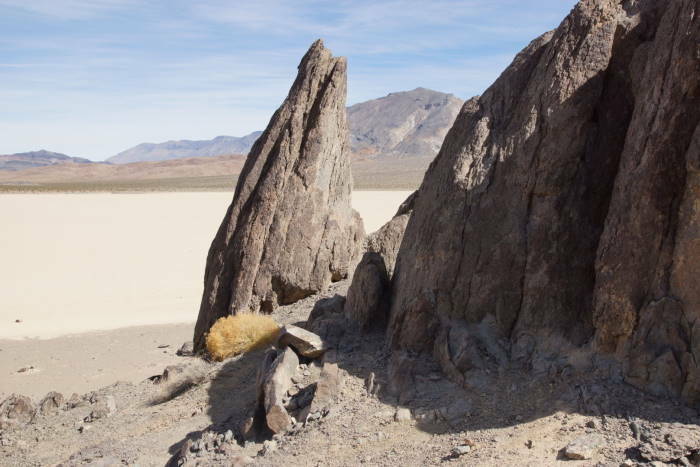 From there, it is 20 miles to Teakettle Junction, and another 7 miles to the south end of the Racetrack, where you will find the best roaming rocks. A high-clearance, 4-wheel-drive vehicle is highly recommended on Racetrack Road. The road has sharp rocks which can flatten tires. 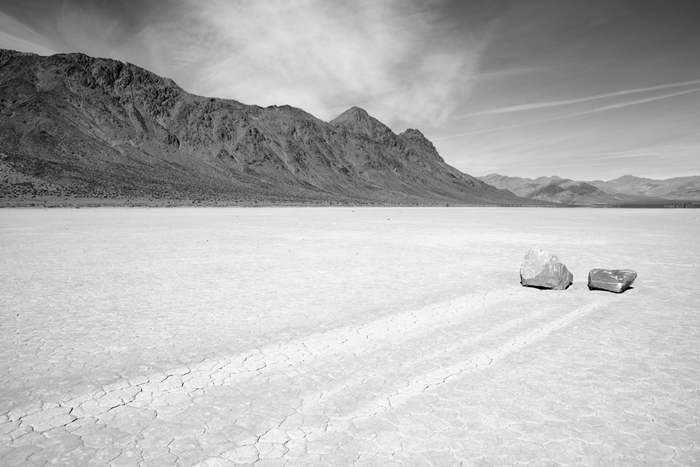 I visited Death Valley’s Racetrack several years earlier, and made a critical mistake. I didn’t drive all the way out to the southern end of the playa. Instead, I stopped at the north end. If there wasn’t so much going on at the south end of the playa, this would be a worthy destination. 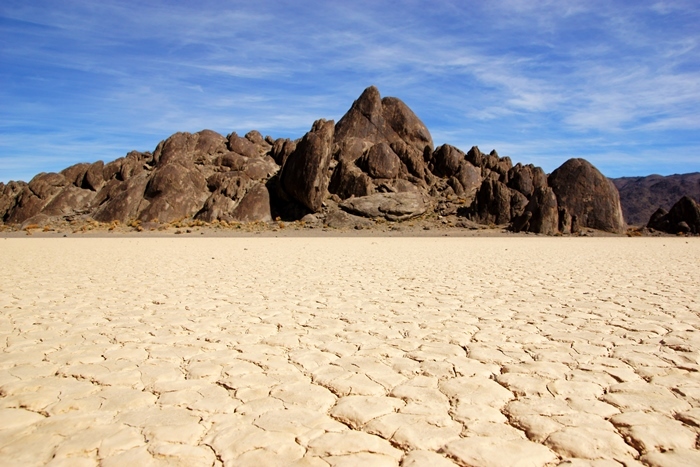 Here, a huge pile of rocks rises from the middle of the cracked, dry earth. It’s known as the “grandstand”, and indeed, if NASCAR paid a visit, this would be a great place to view all the action. A short hike out from the parking area allows you to climb around on the grandstand, and enjoy an expansive view of the valley. 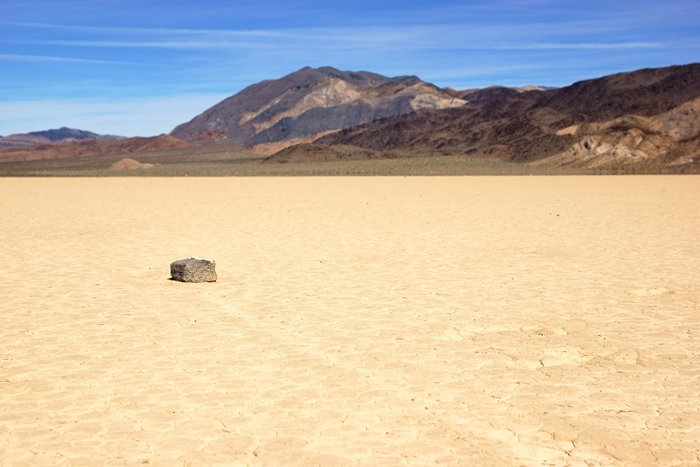 During my previous visit, I searched for the racetrack’s famous rocks in this area, without much luck. I may have found one or two, but I wasn’t impressed. That time, I made a very big mistake — I didn’t read the sign at the north end of the playa, that said the best of the roaming rocks could be found at the south end. This time, I knew better. … and then, a bunch. 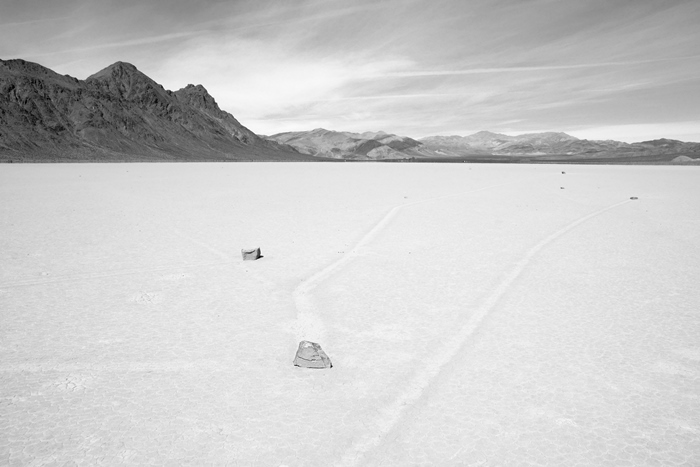 Somehow, by forces only recently understood, these rocks slide across the perfectly flat playa, scraping through the dirt enough to leave a lengthy track behind them. 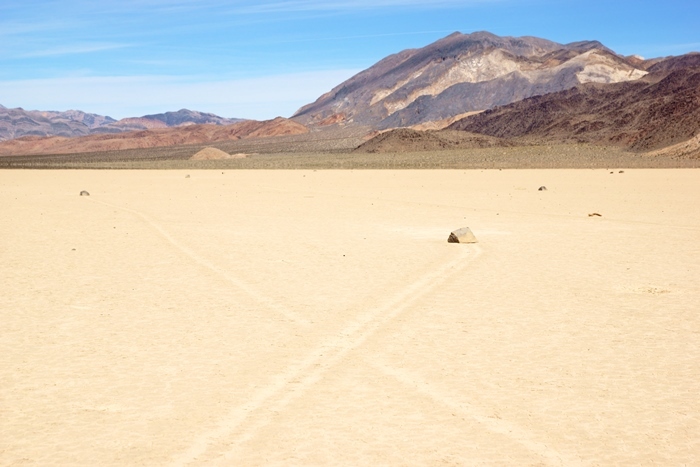 There seems to be no logic behind the patterns — often, the tracks cross one another, and some rocks are clearly moving in the opposite direction of another one, right next to it. 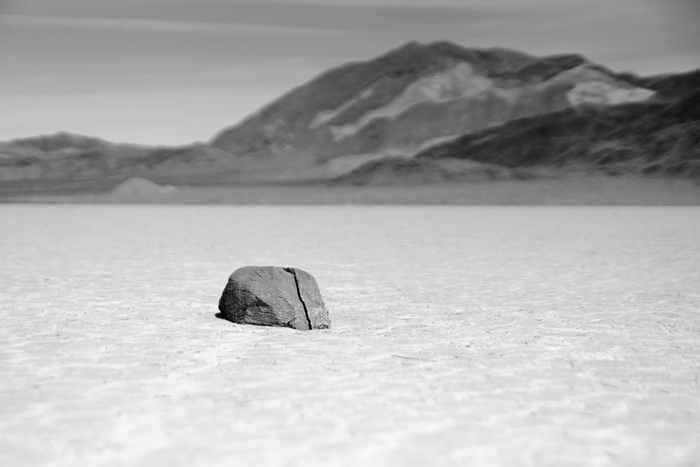 For decades, the behavior of the rocks was a mystery. At first, dust devils were blamed. Hurricane-force winds were speculated as a cause. Aliens seemed like a not-too-distant possibility. It wasn’t until late 2013 that the phenomenon was observed by human eyes. Cousins Richard and James Norris were studying the phenomenon on a December morning, when it all played out in front of them. A heavy rainfall had flooded the playa with water. It had frozen into a sheet of ice, then started to melt and crack. A breeze began to blow, and suddenly the rocks were moving. The wind pushed the cracked ice, which was now floating atop a thin layer of water, and the rocks moved right along with it all — at up to 15 feet per hour. This article in the Los Angeles Times recounts the whole story. But the end of the mystery doesn’t take away the magic from this place. It’s a remarkable feeling to stand in the middle of a playa, knowing the nearest pavement is two gut-jarring hours (and hopefully fewer than one flat tire) away. And then, to see rocks that move by unseen hands, that stumped the smartest people for decades. It’s all quite worth it. It’s unlikely that you’ll be here on a rainy day, but if you are, please do not walk on the playa. When wet, it’s a gooey mess, and you won’t get very far. 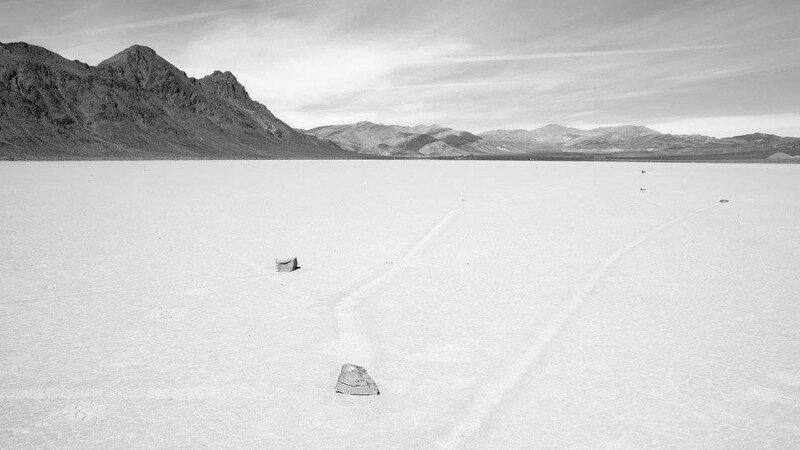 Also, your footprints will remain on the playa for a very long time, possibly decades. 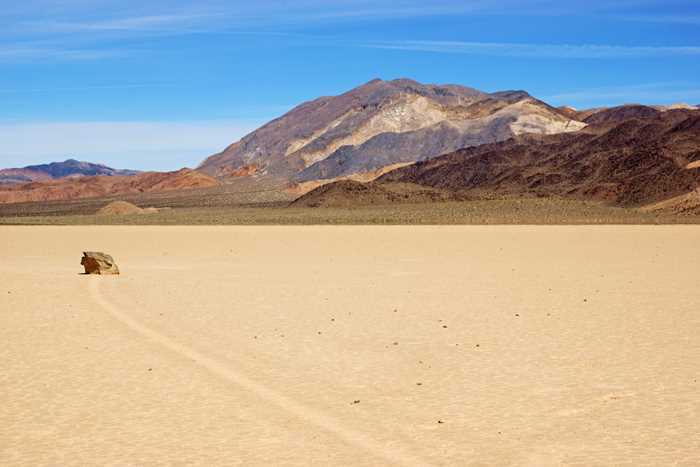 If you’re fortunate enough to have a four-wheel-drive vehicle during your visit to Death Valley, and you have the better part of a day to devote to just one destination, the Racetrack is well worth the time and effort. Even with the mystery solved, the floating rocks are remarkable! Here’s a look at the time-lapse video of the drive out to the Racetrack. You’ll see that it jostled my camera out of position!